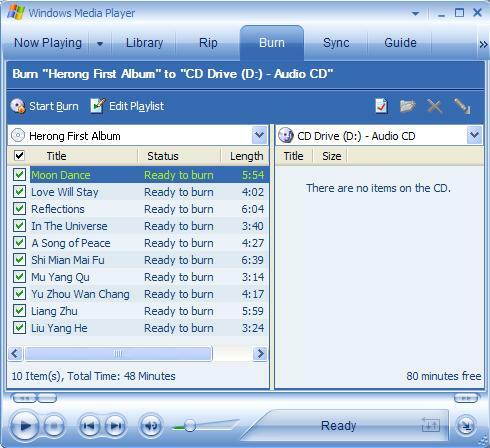 This section describes how to burn or record MP3 music files as audio tacks to audio CD (Compact Disk Digital Audio or CD-DA) with Windows Media Player. 2. Click the Burn tab. You may get a blank burn list. 4. Look at the burn list. Each music is selected to be burned to the audio CD with a status of "Ready to burn". The summary is reported below the burn list: "10 Item(s), Total Time: 48 Minutes". 5. Double check to make sure you have a blank CD in the CD drive. The write speed should be 4X ensure best burning quantity. 6. Windows Media Player starts a two-step to finish burning the CD. First it converts all MP3 files to audio tracks according to the CD-DA specifications in memory. Then it burns all audio tracks to the CD. The whole process took about less than 10 minutes. I was surprised by this speed. I thought that it would take 15 minutes to finish, because the burning speed should be only 4 times faster than play time. 48 minutes of music would take 12 minutes to burn. I guess Windows Media Player ignored my write speed setting. I checked the finished audio CD. I worked perfectly on a regular CD player.